Are you considering the sale of purchase of a home or commercial property in Virginia? If so, we have valuable information about black mold removal in Gainesville, VA, that may save you from a costly investment mistake. Before you agree to sign a real estate contract take a step back and make a minor investment in an environmental inspection and black mold removal to assure you are buying a property with long-lasting, structural integrity undamaged by then ravages of black mold. According to the disaster relief experts at FEMA black mold removal in Gainesville, VA, “the cost of mold sampling, both pre-and post-remediation, may be eligible for reimbursement, provided there is evidence prior to remediation to indicate the existence of disaster-related mold.” Though a caveat emptor exists, for those property owners who contract for black mold removal who have no evidence of mold colonization will be responsible for the subsequent costs of testing for black mold removal. The costs to perform eligible remediation for black mold removal in Gainesville, VA, properties may be eligible for government reimbursement. Be aware that if you fail to take “reasonable measures to prevent the spread of mold contamination to a facility, the rehabilitation and repair of the additional contaminated area will not be eligible for federal assistance.” Proof of extenuating circumstances may waive requirements. Notice the wave pattern against the far wall in this picture of an aggressive black mold. Removal in this Gainesville, VA, property will involve full sanitation of the HVAC ductwork system snaking through the building structure. This is the damage done by just one wall-mounted ventilation duct in one room of this structure. 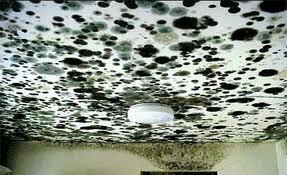 If black mold becomes entrenched, black mold removal in Gainesville, VA, can be staggeringly expensive. Although most insurance companies do not pay for mold treatment, always check with your agent and ask about government programs that may be available for homeowners facing black mold removal in Gainesville. If you need peace of mind regarding the existence and extent of potential black mold removal in Gainesville, VA, contact the environmental specialists at Envirotex – serving the environmental needs of homeowners and businesses in Northern Virginia since 2000.